I’m all about capturing memories. I have a ton of photo albums in all shape and form. And that’s why I can’t live without my iPhone these days, or go anywhere without a camera. It’s like I’m obsessed with making sure I document the girls’ milestones and daily activities as something for them to look back on when they’re older. I keep thinking about my childhood and looking through some of the albums my mom put together for me, I’d have to admit that they trigger a lot of sentimental and fond memories. I want that for the girls too. Over the years we’ve had some really great photo shoots here in Manila (except for one but let’s not get into that! positive thoughts! ), including one that captured the four generations in my family with Sam and my Mama Mia still alive. That was precious to me. 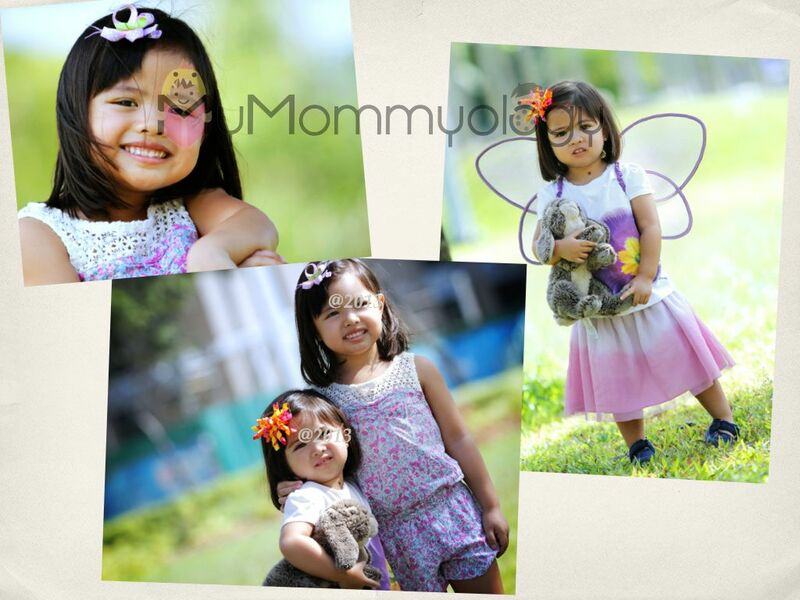 Last year we were gifted with several outdoor shoots too, a first for us. 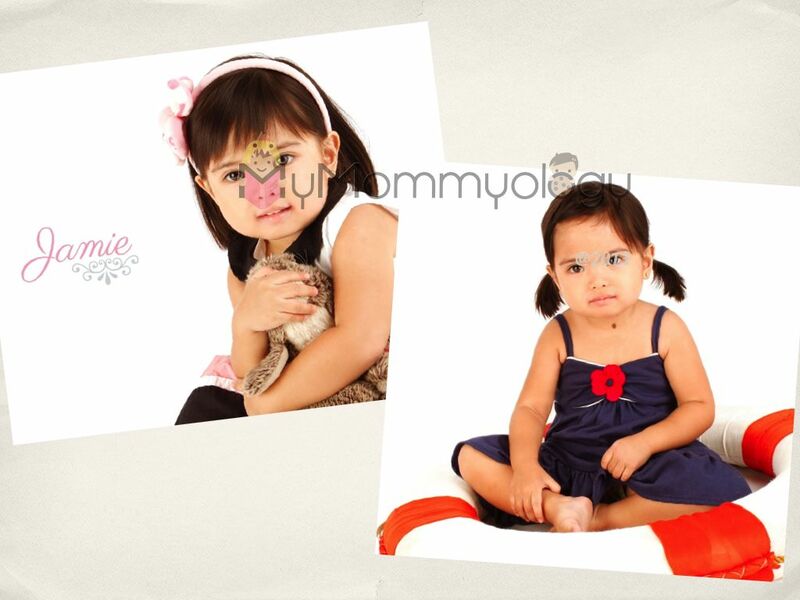 The girls I was told, were relatively easy and cooperative and the out takes turned out great. 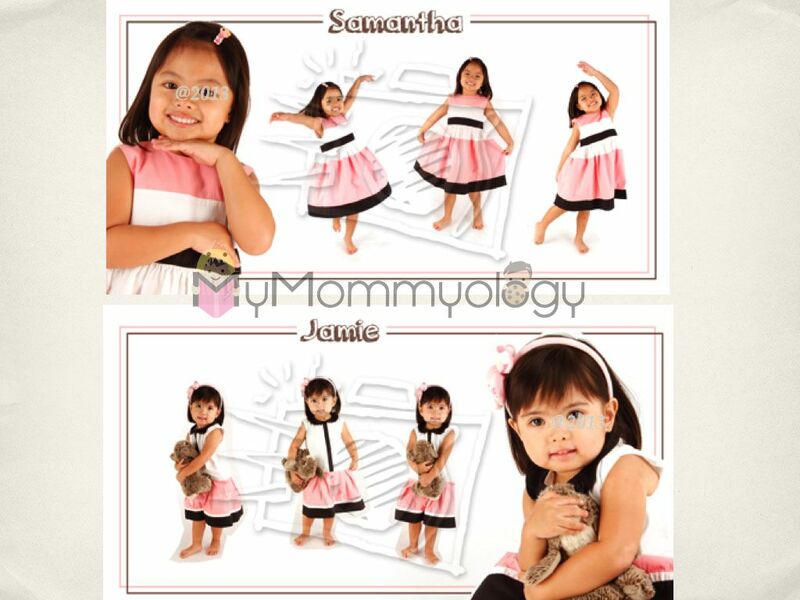 This year, the SoMoms were gifted by The Picture Company with a family shoot. I gladly accepted and booked with the Bonifacio High Street Branch right away. I initially thought we’d do another outdoor shoot (as only the BHS branch does this), but then I figured it’s also been a while since we did an indoor studio one. Eva our photographer was quick to say that we could do both. She also did an interview with me to check on our family’s personality. Then a few days later I receive an email from her with pegs and suggestions of what to bring to the shoot. That was pretty cool. On our first Sunday over at The Picture Company, we did the indoor shoot and the girls were pretty good about hamming it up for the camera. They specifically requested for their own change in outfits too. I felt Eva was able to capture both Sam and Jamie. When my husband saw the pictures, he was quite pleased. “It’s really her!” “That’s sooo her!” he’d exclaim when we first saw the slide shows. Jamie of course, brought Bunny. They were both “so themselves” in these pictures! Does that make sense? The Sunday after, we went back for our outdoor shoot at an earlier time. From past experience, I knew to bring water, food and some bubbles. The girls were a sport about it for a good 30 minutes, but after they both good moody and tired. Jamie got itchy, and it was downhill from there. Still, somehow in the midst of all of that, Eva was still able to capture some really precious moments. Love the way the green fades and the girls stand out! And again I found myself daydreaming as to where in the house I would hang these up. I also know they’d make perfect gifts for the grandparents. They’re actually the hardest people to gift come Christmas because I feel that they have everything (Our parents spend their lives giving to us. What do we give back?). 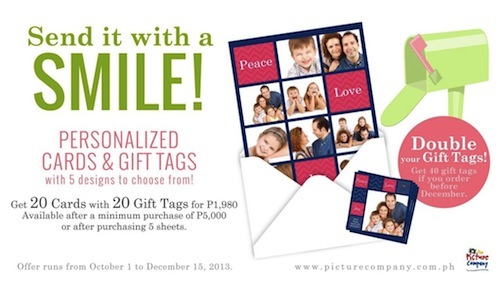 What better gift to give them than photos of grandchildren? I’m sure there is space in my mom’s house and on my mother-in-law’s piano for just a few more of these. As a member of The Picture Company, they have this package which entitles one to double the prints at half the cost on your birthday. Thankfully, Sam’s birthday is tomorrow (and on that note I shed my first tear! sniff!)! So I happily picked a second set of prints. 🙂 Yay! 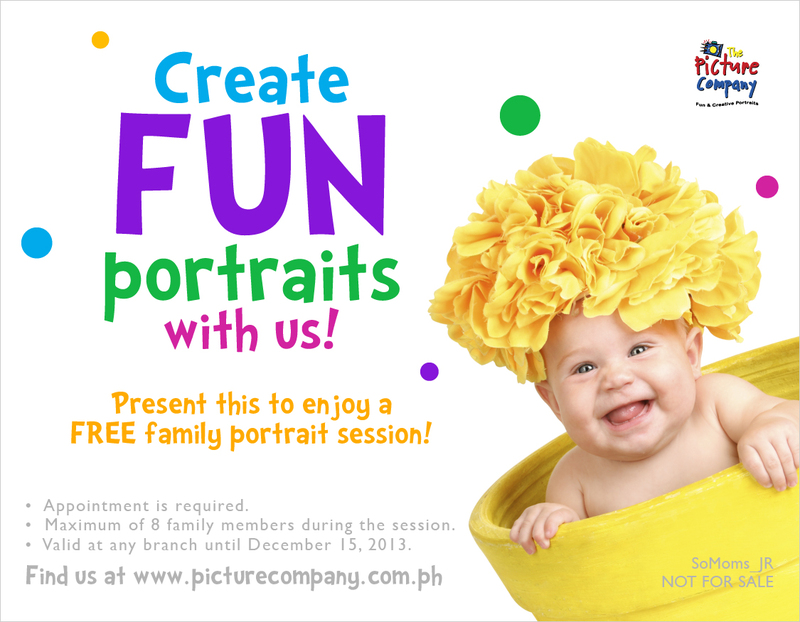 Get your portraits done today! 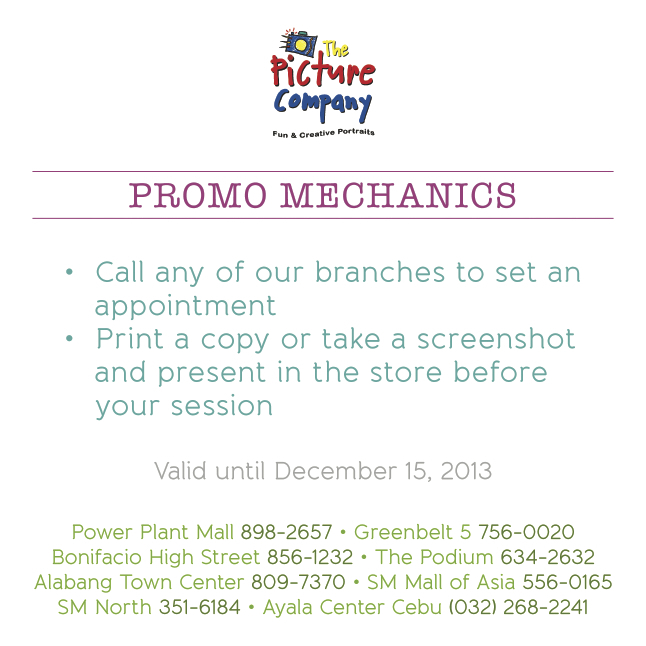 The Picture Company also has some cute Christmas cards, and this promo runs also until December 15. That’s another cool “gift” to give for the holidays. I know it’s a tradition for families to send out these cards in the US (I loved collecting the ones we got every Christmas from family and friends), but I haven’t seen it done much here yet. Well maybe now’s the time to start. 😉 20 Gift Cards and Gift Tags can go a long long way.